If we're hearing about the lady in black, it's not usually a super positive story. Either she's lurking on the edge of the moors or appearing on the side of the road on misty nights. But the lady in black isn't always the gloomy ghost she's made out to be. She might be cursed to haunt the world but she knows how to have fun too. For instance, after her stint haunting foggy roads, she can also be found tossing energy orbs with her friend the poltergeist. Or she often keeps herself busy scratching at windows and keeping innocent children awake at night. When they wake up and tell their parents, she scoots to the side of the window and belly laughs as the parents blame the tree branches. 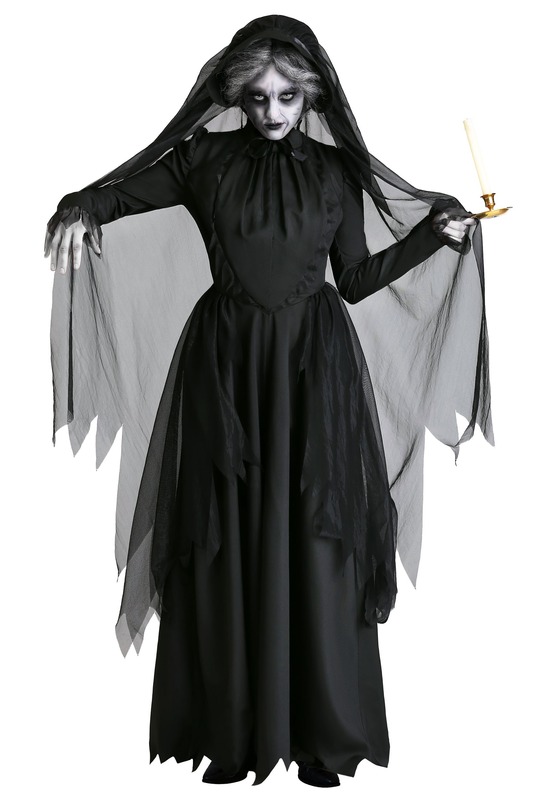 That might seem scary to us but that's just how the lady in black has fun. This dramatic, ghostly ensemble is Made by Us, which means our in-house design team put extra effort into creating a look that's flattering, unforgettable, and will stand the test of time. The level of thought in the detail really shows up in the bodice. There's rushing along the center panel and pleating coming down from the high neckline. The long sleeves are trimmed in sheer fabric. The skirt has a sheer fabric overlay and a raggedy hemline. 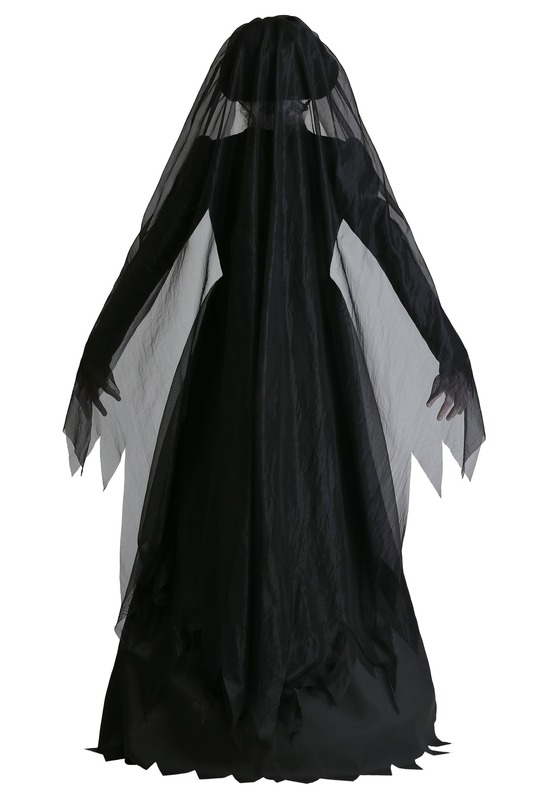 The costume is topped off with a black bonnet and a long raggedy veil that can be pulled over your face for an extra spooky feel! When it comes to dressing up as a ghost, you've got options. You could go the lightweight way, less spooky. Or you could fully commit to the spooky side of things with a lady in black costume. 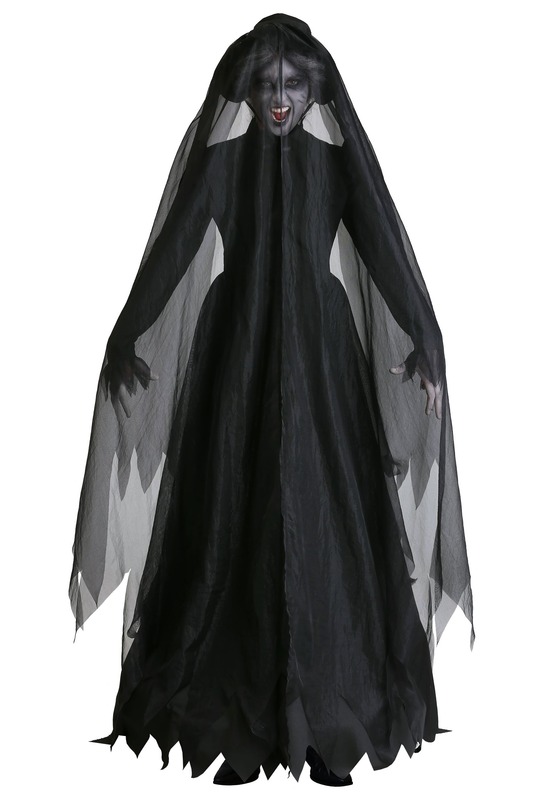 Pair this costume with an eerie grey wig and ghastly pale makeup and you're sure to cast a delightful feeling of gloom where ever you go!